Your boiler must be at the correct pressure for the hot water to circulate properly between the radiators, especially if they are on different floors. Generally, the ideal pressure is between 1 and 2 bars, but this may vary from boiler to boiler. Ask your heating engineer. 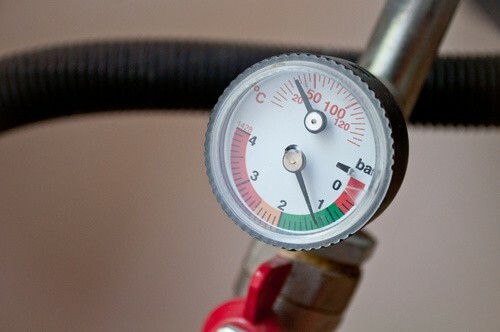 The pressure gauge needle indicates the actual pressure of the system. A green zone shows the correct pressure range, while a red zone shows the critical zone. A red needle serves as a marker, while a black needle corresponds to the actual pressure.These two needles should be on top of one other. In some boiler models, the water pressure is given by indicator lights on the control panel. What if the pressure in my boiler is too low? Locate the two filling valves. The needle might stop at the beginning of the green zone without going much further even if you fully open the valve. This is probably because your house's water system is equipped with a pressure reducer, which is essential for some devices (boilers in particular).The water pressure may be higher or even too high in some neighbourhoods in the lower parts of the city. If the needle stops at the beginning of the green zone, this is enough. Fully close the second valve.Tighten it but not too hard, i.e. without "blocking" it. Fully close the first valve.Tighten this one up as well. What if the pressure in my boiler is too high? Your boiler deals with this itself.It is equipped with a safety valve which releases the excess pressure.That means it’s perfectly normal to see a drop of water on this valve from time to time. However, if you spot a continuous flow of water, call your heating engineer.Either your valve is defective or your system is overpressurised. If the pressure increases continuously despite the water discharge through the valve, check that both filling valves are closed.What if the pressure doesn't decrease?Turn off the boiler and call your installer. It is sometimes a good idea to check whether the radiators need to be bled. This operation removes air and some water from the circuit, which will lower the pressure. But if it stays high after bleeding, turn off the boiler and call your installer. Be careful because if the pressure exceeds 3 bars, the safety valve will remain open and you risk a small flood.If this happens, turn off the water supply to the boiler by closing the isolation valve. If you can't find it, turn off the water supply at the meter and wait for the heating engineer to arrive. 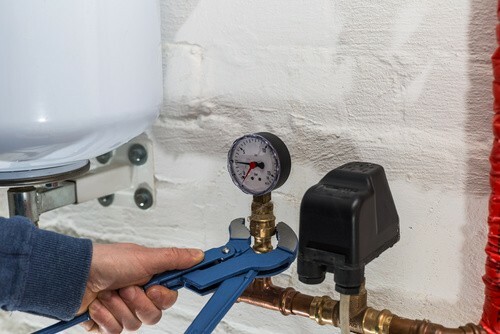 When should I check my boiler pressure? There is no need to check it every day, or even every week. The pressure generally remains stable. The expansion tank compensates for variations in volume (and therefore pressure) caused by expansion and contraction related to temperature variations.